Born in Kagoshima. Son of Hashiguchi Kanemizu, a samurai and amateur painter in the Shijo style. Given name Kiyoshi. Reported to have taken the name Goyo while in art school because of fondness for the five-needle pine (goyo matsu) in his father’s garden. The elder Hashiguchi engaged a teacher of Kano-style painting for his son when Kiyoshi was 10 and in 1899 encouraged him to study Japanese-style painting under Hashimoto Gaho in Tokyo. Goyo shifted to Western-style painting under Kuroda Seiki at Tokyo School of Fine Arts; graduated in 1905 at the top of his class. In 1905 he designed the layout and illustrations for Natsume Soseki’s novel I Am a Cat and this led to design of other books by Futabatei Shimei, Uchida Roan, Morita Sohei, Tanizaki Jun’ichiro, Nagai Kafu, and Izumi Kyoka. Won recognition for an oil painting in the first Bunten show in 1907 but was disappointed in the unenthusiastic public acceptance of his oil paintings in future shows. Became member of Museikai. In 1911 won recognition for an ukiyo-e poster designed for the forerunner of the present Mitsukoshi department store and thereafter became a serious student of ukiyo-e. From 1914, while generally in frail health and suffering from beri-beri, he contributed articles on various ukiyo-e studies to Art News (Bijutsu shinpo) and Ukiyo-e magazine. Watanabe Shozaburo, aware of Goyo’s ukiyo-e poster and his study of ukiyo-e, urged him to design a print for artisans to produce under Watanabe’s direction. Accepting this challenge, Goyo designed Bathing (Yuami), 1915. Watanabe wanted to continue the collaboration but Goyo did not. 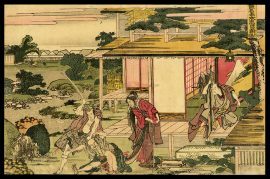 Instead, he worked in 1916-1917 as supervisor of reproductions for 12 volumes called Japanese Color Prints (Yamato nishiki-e) and in the process became thoroughly familiar with the functions of artisan carvers and printers. At the same time he was drawing from live models. From 1918 until his death he personally supervised the carving, printing, and publication of his own works. His total production, including Bathing, numbers 14 prints. After his death a few more of his designs were developed into prints by his heirs. ** Taken in whole, or in part, with permission from: Merritt, Helen and Nanako Yamada. Guide to Modern Japanese Woodblock Prints: 1900-1975. University of Hawaii Press: Honolulu. 1992.